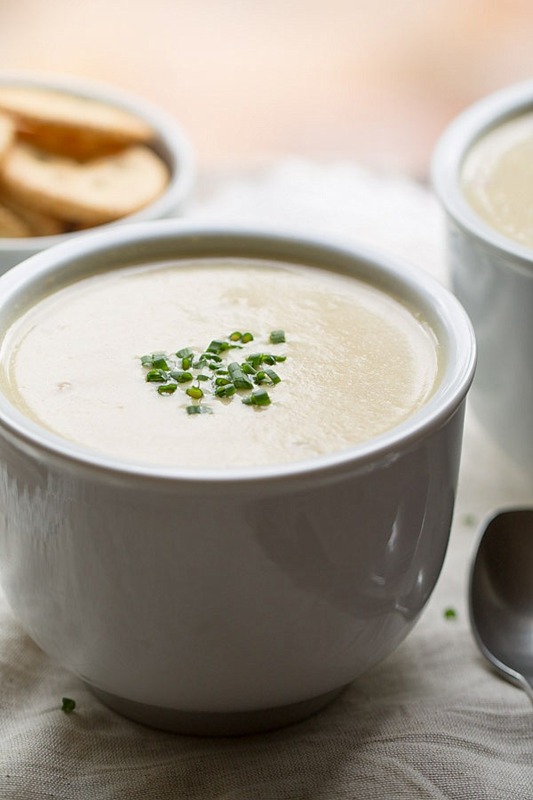 It’s in the midst of summer and I’m all about soups. 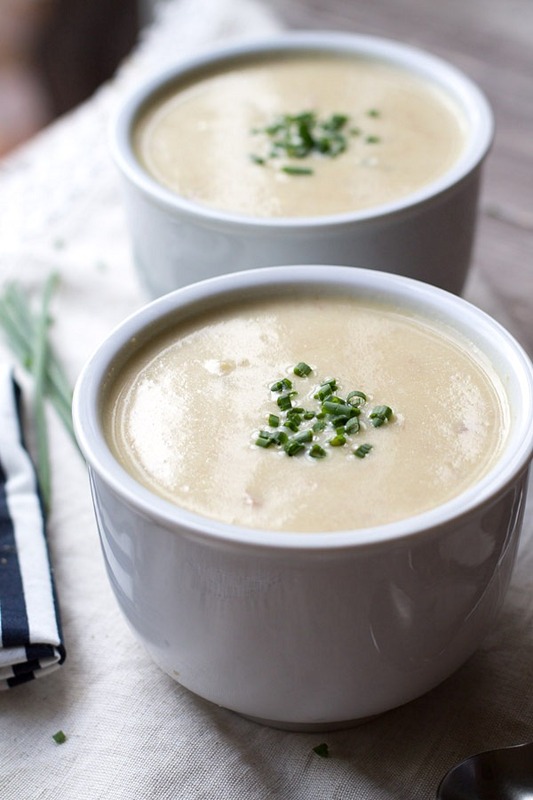 Especially creamy tasty soups like this Slow Cooker Potato Ham and Leek Soup. We’re coming to the end of the second annual #SlowCookerWeek which means the Las Vegas vacation is quickly approaching Ken and I. Before I get to vacation, let’s do a small recap of Slow Cooker Week. 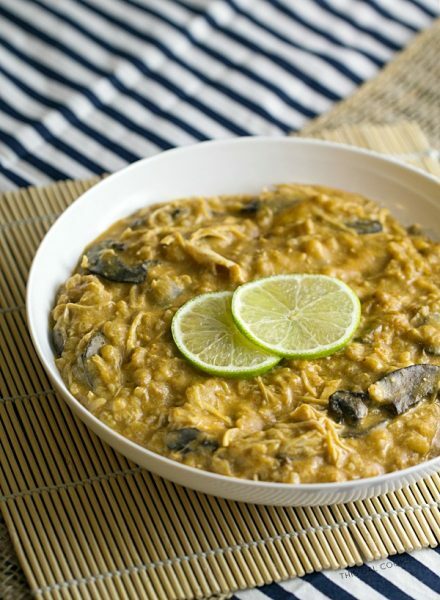 On Monday, a few of my blogging pals and I kicked off slow cooker week. I shared a collection of 25 Favorite Slow Cooker Soup Recipes along with a giveaway. You can check out the recipes and enter the giveaway here. But hurry – the giveaway ends at midnight tonight! 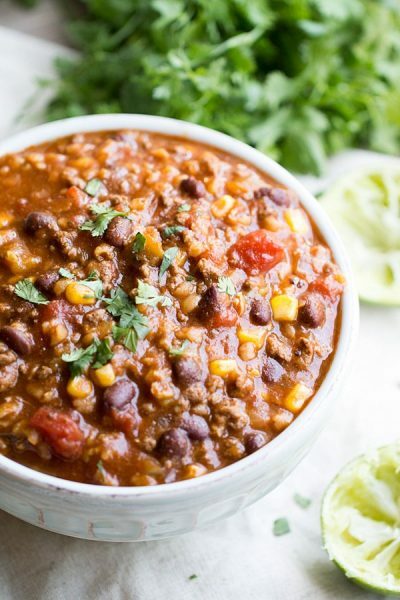 On Wednesday, I shared this crazy good Slow Cooker Tex Mex Soup. Pair it with an ooey gooey grilled cheese sandwich and you’ll be swooning all day. On Friday, a few of my blogging pals and I kicked off a Round Robin Giveaway on Instagram. The giveaway ends tomorrow morning – you can enter to win here. Today I’m sharing this Slow Cooker Potato Ham and Leek Soup. You can pair this one with an ooey gooey grilled cheese sandwich too. I recommend at least three slices of cheese on the sandwich. Rent a car and drive to Laguna Beach, CA so I can see the California coast. And so I can say I’ve been to California. Luckily, we have someone coming to house and dog sit for us so we won’t have to bring the monster dog on the plane with us. But I am going to miss her! And she is probably going to be extremely angry with us for leaving her for a few days. But our friend that is staying at our house has watched her before and she likes him. So I think she will be ok. I think she’s a little too old to be comfortable on a plane trip that would require her to stay in a carrier under the seat in front of us. What are you favorite soup toppings? Mine depend on the type of soup. For this soup, I opted for fresh chopped chives and shredded cheddar cheese. Cheese tends to end up on top of all of my soups. If you haven’t heard, I have an immense love for cheese. It finds it’s way into many places in my life, most often on a plate and straight into my mouth. Enjoy the recipe. And the cheese if you opt for cheese. Place the potatoes and ham in a slow cooker. Sprinkle with the seasoned salt. In a skillet over medium heat, melt the butter. Add the leeks and saute until tender. Add the minced garlic and saute for one more minute. Add everything from the skillet to the slow cooker (including the butter drippings) and mix well. Pour the stock over the mixture and mix well. Cover and cook on low for 6 hours. After the soup is done cooking, remove half of it and place it in a blender. Blend until smooth. Return to the slow cooker. Whisk together the half and half and the flour. Microwave in 15 second increments until thickened, whisking between each heating session. It is important that you do not overheat the flour/half and half mixture. If you overheat it, it will start to cook and you will need to discard and start this method over. Once the mixture is thickened, pour into the slow cooker and mix well. Serve the soup in bowls and top with your favorite toppings. I’m pinning this for winter time. 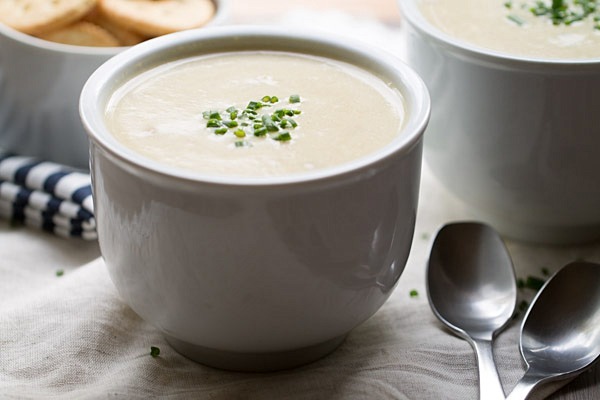 i love to make soups and freeze them to have them on hand. I love to put cheese and sour cream in my chili but it depends on my mood with everything else. thanks for sharing, it looks yummy! Happy Saturday! You’re welcome, Leslie! Thank you so much for stopping by. Hope you have a great week! I love potato soup and this sounds wonderful, Julie. Another lovely recipe. Thank you. I love a good bowl of soup and this one looks fantastic Julie!! And your pics are gorgeous as always!! Have a great time in Vegas!! My favorite place in Vegas: The Grand Canal in the Venetian!! I love hanging out in the Mexican restaurant there sipping Margaritas. You feel like you are outside without the Vegas heat!! Thanks for stopping by, Renee. Hope you have a great week! Mmm … this soup is definitely calling my name right now as I sit here shivering on a cool (I can’t really bring myself to say cold because it really isn’t) winter’s evening here in Australia. Ham and leeks are a match made in heaven. P.S. 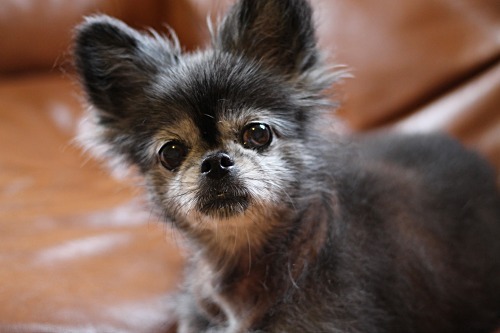 How cute is your doggie?! What breed is he? Julie! I adore chives and fresh cheese in my soup. But to be fair, I love cheese in pretty much everything ;) Your dish looks divine! Mmm, I love cheese on just about everything as well! Thank you so much for stopping by, Kristy! I am such a potato soup nut, that when one of my co-workers makes potato soup at home she brings me a bowl to work Also my slow cooker is MY friend. So I pinned this is a NY minute, which I assume is fast since it became a popular saying. Ha! Hey major fun vacation you have on your docket. There is no doubt you will have a most excellent time. Well that is awesome that your co-worker brings potato soup to you whenever she makes it! Heh, I love my slow cooker. I used it today to cook some chicken that I could have easily baked but I wanted my slow cooker to do the job instead. :) Looking forward to the vacation…and seeing mountains again! Thanks for stopping by, Carol. Hope you have a lovely week! Wow, this is one great recipe cant wait to have one. Hope you enjoy it! Thanks for stopping by! Can’t get enough of your little fuzzy! 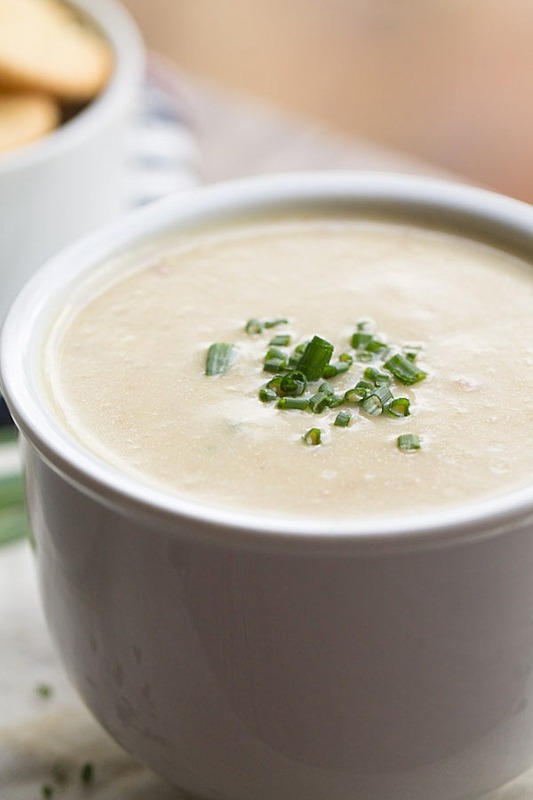 These soups like awesome – I’m DYING for fall with our heatwave. Pinned! OMG, I am totally ready for fall too! It’s been hot and humid here in Florida. I’m ready for some cooler weather! Thanks Amy! It’s hard to believe that vacation is only a little over a week away! Looking forward to seeing mountains again. It’s been 10+ years since I’ve seen them!!! Pingback: If all the raindrops were | What's for dinner?